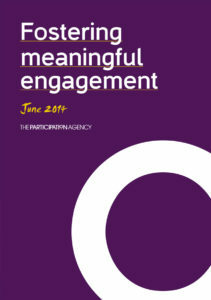 This report, produced with our partners in the Participation Agency, looks at engagement in the not-for-profit sectors. What drives it? What impact does it have? What methods do people use? And how do they evaluate it? Our research was formed of an online survey, which attracted 70 responses from across the not-for-profit and public sectors, and a series of qualitative telephone interviews to explore the issues in greater depth. Together, the results have raised some interesting points, spotlighted some excellent examples, and triggered some important conversations about how meaningful engagement can be fostered by and within voluntary and public sector organisations, to bring about improved strategies and services.